I checked out this weeks Word Art Wednesday and found one of my favorite scriptures, Psalm 51:10. Right away I wanted to get to work on something for it - which is a great thing because as you know I have not been creating much at all in recent weeks. I start my page by misting with 3 shades of pink/purple Adirondack color washes. Then, I took a watered down gesso mixture and pulled the color across the page. When that was dry I took out 2 of my favorite Crafters Workshop templates and Snow Cap and Silver Adirondack Paint Daubers. I wrote the word Create across the upper left and Renew along the bottom right with an embossing pen and used some Violet embossing foil. 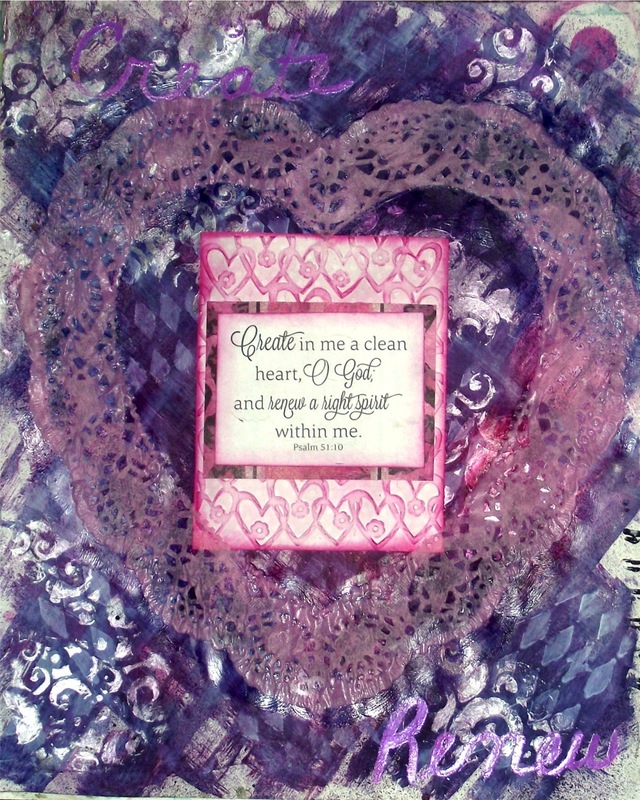 I mounted the scripture to some pink patterned paper and then onto a light pink dotted paper which I ran through my Sizzix Embossing Folder with linked hearts. 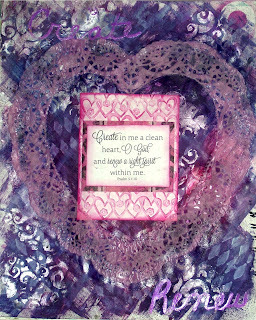 I took some Raspberry Distress Ink and blended over the hearts. I attached this in the center of the page. Then I took out a large pink heart doily. I cut the center out of it and adhered it to my page using heavy gel matte medium. Thanks for dropping by. Hopefully I will have something new for you over the weekend! Hi Paula! It's always SO NICE when you can join us. What a beautiful job you done transforming this week's word art in a creation of beauty. Wow! Thank you so much for sharing this. I will just bet it is even more magnificent in real life with all those wonderful textures. Wish I could see it up close! You take your art very seriously. All that work paid off with this beautiful creation.